villa con 4 camere in affitto per le vacanze a Salobreña (Monte de los Almendros). Controlla tutti i dettagli, le foto e le recensioni dell'immobile n° 2088. 5 * villa with heated, safety enclosed pool, hot tub, covered porch, central hot and cold air conditioning, internet access & great sea views. The villa is situated on the mountainside with a perfect view of the sea. A car is needed to go to the beach, restaurants and shopping. We had a few days with sea fog that covered the sea level area, but we had a clear sky and where not at all bothered by the fog. Our stay was in late October, but the heated pool was 29 degrees (Celsius) which the kids just loved and they spend 3-4 hours in the pool every day. The pool area is very private and covered by the sun from morning until 6pm (late October) The villa is fully equipped, and we very much enjoyed that we did not have to buy spices, kitchen paper ect. We also very much appreciated the welcome package which meant that we didn’t have to go shopping the first morning (full breakfast in the refrigerator). One of the very best villas that we have ever tried, and in value for money – the very best. We will definitely return. We stayed in this beautiful villa for about a week. Everything was in perfect order; the bedlinnen and towels where clean, the pool and the whirlpool where warm, there was a welcomming package in the fridge, the house was in perfect condition. We stayed with a group of 8 persons, which fits easily. The service is very good, contact with the agency was perfect and polite. Tops of this villa: - Location: beautiful view, though you need a car to go to the beach or town - Villa: very spaceous, airconditioned with all you need included Must do's: - walk in the Sierra Nevada - order paella (they'll bring it to you) - BBQ on the gas-BBQ (included) - Go to Granada (Alhanmbra, don't forget to book) - Visit the Nerjacaves - Relax at your own poolside, take a swim, read a book Thanks a lot! This is a lovely villa with all the amenities. Basic necessities (including bottle of tinto) awaited our arrival. We were a party of 6 and were very comfortable. Pool, hot tub, patio with gas grill all great. 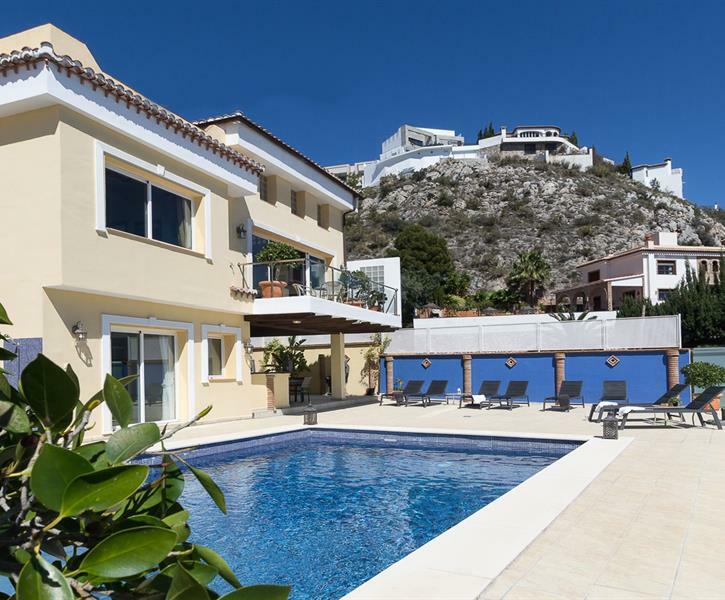 Located in the hills above Salobrena with great panoramic views, but a drive to the town. Beach restaurant in Puerto de Motril great (golf course was a bit cheesy and over-priced), historical sites and charming towns nearby. Easy one hour drive to Granada or Malaga. We were very well catered for by Christine at Cumbra Villas. Ps. the electricity for the pool is pricey.